What is a 5,000 year old vast, open-air sun temple doing in the middle of Canada’s stark plains? Driving mainstream archeologists crazy, for one thing. 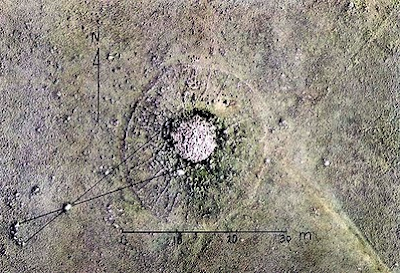 Retired University of Alberta professor Gordon Freeman says that this rock-encircled cairn is in actuality the center of a 26-square-kilometer geodetic “lattice work” designed to mark the changing seasons and the phases of the moon - with an accuracy far greater than our current calendar. If Freeman is right, this astrophysical act of landscape architecture predates England’s Stonehenge and Egypt’s pyramids.